Isn't it time to get out of the classroom? 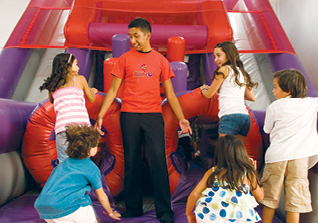 Field trips have been shown to improve kids' socialization skills, and BounceU makes sure it'll be a day to remember. Leave the pencils at school, allow us take care of the planning, and let your class get its bounce on! Perfect for day care, school field trips, school PTA events, youth groups, summer camps, or anyone who just wants to bounce! Our Field Trips are privately held for your group, and supervised by our trained and friendly staff.